Portable projectors are a dime a dozen these days, and they’re pretty nifty devices that are great for creating a nice big screen anywhere you want. Some are better than others, but they pretty much all need to be placed in a very dark area in order to project a halfway decent picture. It can also be tricky to connect some devices to certain models, plus sound quality is always a big problem. Do you really want to watch a 60-inch screen with sound coming out of a smartphone? Of course not. The Nebula Mars by Anker isn’t a portable projector. It’s a portable home theater that is 2-3 times brighter than comparable products and includes built-in JBL sound. It connects wirelessly to any iPhone, iPad, or Android device, and it even has a massive built-in 19,500 mAh battery for 3 hours of non-stop viewing! * Brilliantly Defined Picture: A groundbreaking 3000 Lumens lamp delivers a crisp 800p picture with enhanced contrast for sharp, clear daytime viewing. * JBL Audio: Dual 10W speakers flood any room with high-fidelity sound. * Extended Viewing Time: A revolutionary 19500 mAh battery, a first for a projector this compact, delivers an unrivalled 3 hours of non-stop cinema. 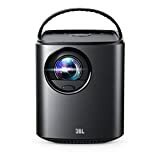 * Total Connectivity: Wireless cast to seamlessly stream content from iOS and Android devices.Notes: Does not support chromecast or windows miracast. * What’s in the Box: Nebula Mars, power adapter, manual, remote, 12-month warranty and our friendly customer service.